"Almon S Eaton, 84, the last of the Civil War veterans in the town of Seabrook, died at his home there on Thursday. 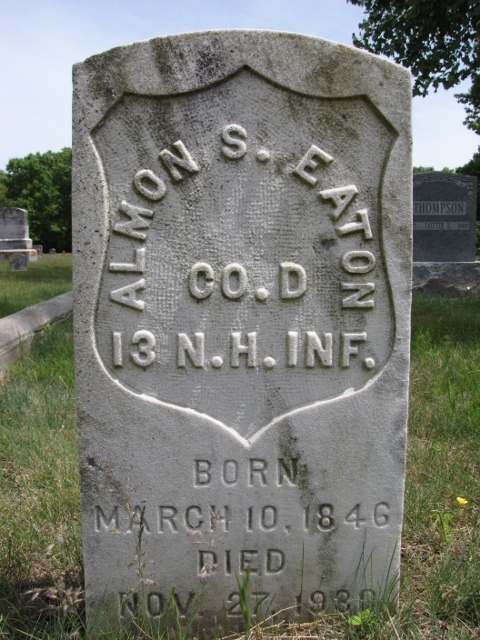 Mr Eaton enlisted as a private in Co B, 2nd New Hampshire Infantry, August 12, 1863, and also served in the 12th New Hampshire regiment, taking part in many of the most prominent engagements of the Civil War. After serving his country for 2 1-2 years, he was honorably discharged at City Point, Va, Dec 19, 1865." Note: the data in his death notice is a bit off, as he served in the 13th NH, not the 12th (the Boston Herald, on 11/30/1930, also ran this article, but listed his regiment as the "18th"). He enlisted as a substitute on 12 Aug 1863 from Seabrook, and was mustered into Co D, 13th NH Infantry on the same day. On 21 June 1865, he was transferred to Co B, 2nd NH Infantry, and served with them until 19 Dec 1865 [Aylings]. He is buried in the Wildwood Cemetery in Seabrook.